I have at least one more full day of sanding ahead of me. Perhaps even two. So instead of dragging that topic out with more “progress” posts (because let’s face it, y’all just want to see the finished floor, right? 😉 ), I thought I’d move on to another topic. Y’all, I agonized over those floor plans for the house for days. Every spare moment I could find was spent tweaking this, moving that wall, arranging this that way, moving this door from here to there, and so on, and so forth. I poured over every single one of your suggestions, and really considered all of them. Then I went to the house, and just stood inside, wandered around, took more measurements, pondered, and let the house “speak” to me. (That sounds so ridiculous, doesn’t it? Let the house “speak” to me? But I swear to you, that really is what it felt like.) And then I came home and scoured Houzz for inspiration. After all of that, here’s the finalized floor plan that I came up with. 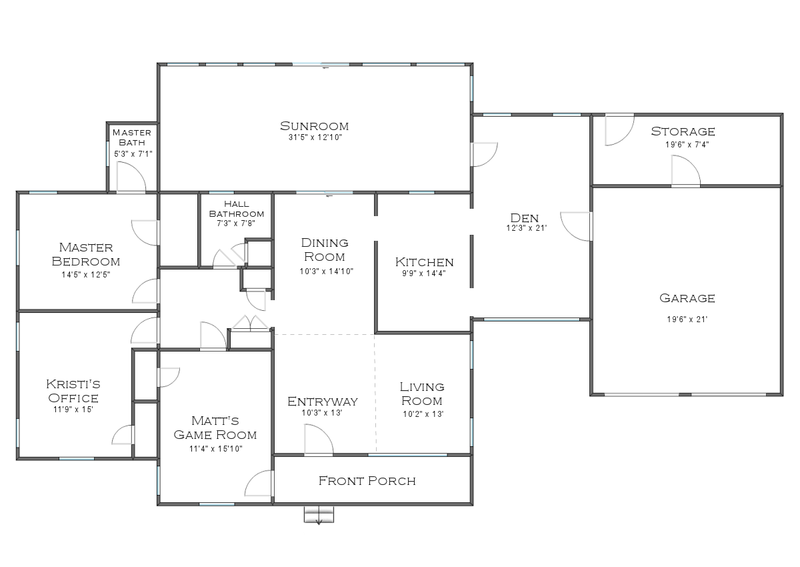 And here’s a quick-view of the two floor plans. Just move your mouse pointer on and off of the picture to see the before and after. 1. There’s no dining room. The more I thought about it (and especially after re-reading all of your comments on the A2D Facebook page about dining rooms), the more I realized that a formal dining room was a waste of space. If I ever need to entertain more than six people (the number that will fit around the Craigslist table that I’ll be using in the breakfast room), then I’ll have plenty of space to set up a large temporary table. But the rest of the time, I’d like that space to be something we’ll use regularly. 2. There’s no faux wraparound porch. On one of the interim plans, I had replace the large window in the den with French doors that led out to a sort of wraparound porch in the front. But a couple of you pointed out that we probably would never really use that space. The more I thought about it, the more I realized how true that is. Sadly, we’re not really a sit-on-the-front-porch-and-chat-with-neighbors society anymore. So rather than pour money into creating something like that in the front, I’d rather spend that money on creating a nice back yard, complete with a deck or two off of the house, including one off of the breakfast room. And the front porch will simply be extended as much as it needs to be to make it easy for Matt to safely enter and exit the house. 3. I relocated the utility room / mud room. One of my biggest issues with the first floor plan, and then the interim floor plans, was the location of the utility room and mud room. They just seemed so far away, and the mud room location actually created the need for an additional half bath. That would cost a fortune since new plumbing would have to be run to that side of the house, and that side is all concrete foundation rather than pier and beam. So with the new location, it puts the utility room closer to our bedroom (which just makes sense to me), and it creates a more direct path from the back yard, through the mud room, and to the existing bathroom. No need for a costly addition. The thing I’m the most excited to get started working on is the entryway, and creating some definition between the entryway, the living room, and the area that was originally the dining room. Right now, it’s all one big, open area. I know lots of people love big open floor plans. I don’t. I prefer definition between spaces. But let me emphasize, I don’t want it to feel closed off, but just defined. When I came across this entryway by Regan Baker Design via Houzz, I stopped in my tracks. 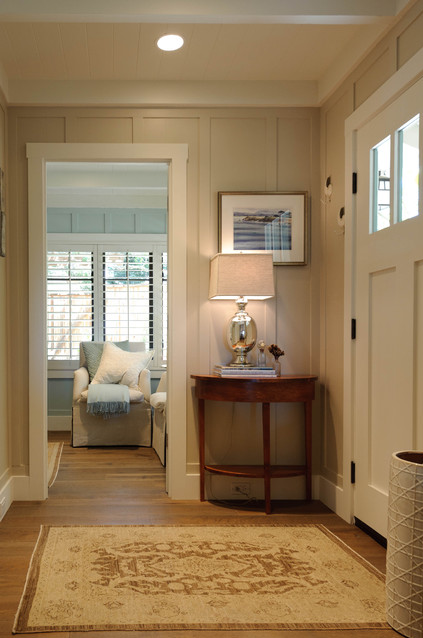 I love everything about this entryway, from the color of the hardwood floors (I’m desperately hoping that mine will end up similar to this in color), the board and batten walls, the simple baseboards and trim around the doors, the front door, and the wall color. Of course, my entryway will be wider and longer, and rather than the standard width doorway being off to the right of the entryway, I want a really large opening into the living room. Now let me share my embarrassing brain fart moment. Actually, it wasn’t just a moment. It was several days. Two or so months, even. For at least two months now, I’ve had the vision in my head of what the area would look like leading from the entryway into the living room. I wanted the doorway to be really large, really open, and also to include a multi-pane window on each side of the opening. You know…kind of like a stationary French door that is actually part of the wall on either side of the opening. And for at least two months now, I’ve been racking my brain trying to figure out what those would be called, and what kind of windows I’d need to order. Seriously. I’ve Googled everything from “interior multi-pane windows” to “interior sidelights” and “interior multi-pane sidelights”. And I couldn’t find anything. Nothing. I almost gave up, and started gathering other ideas. In fact, just yesterday as I was watching the latest episode of Covert Affairs, I took a screenshot of this half wall design that I thought might work. It’s nice, and I really like it, but after having my heart set on the other design for so long, it just felt disappointing to settle for something like that. But I couldn’t figure out what those inset windows are called, so how in the world could I locate them if I don’t know what they’re called?! And then last night as I was clicking on links from Facebook, I came across an awesome living room before and after post from Jennifer Rizzo, and my heart skipped a beat when I saw this picture. It’s almost exactly the look I want to create! So I frantically scoured the post, wondering where in the world she found those amazing windows, and what the heck are they called? And what did she use to create that look? Y’all, I felt like the biggest idiot ever. 😀 Seriously, all I could do was sit there and laugh at myself. I know I have a tendency to make things way more complicated than they need to be at times, but this has to be one of my biggest “dumb” moments ever. 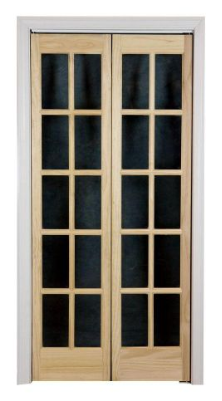 So I headed over to the Home Depot website and found exactly what I need — this bi-fold French door. I have no idea at this point what size I’ll be needing, but it comes in several sizes. Right now, I’m thinking of getting the 30-inch door, which will give me two 15-inch panels. But I’ll have to measure everything out and see if that size will work. So there you have it. My completely dumb “brain fart” episode of trying to figure out what interior, stationary French-door-type windows would be called. 😀 *Sigh* Embarrassing, but funny. 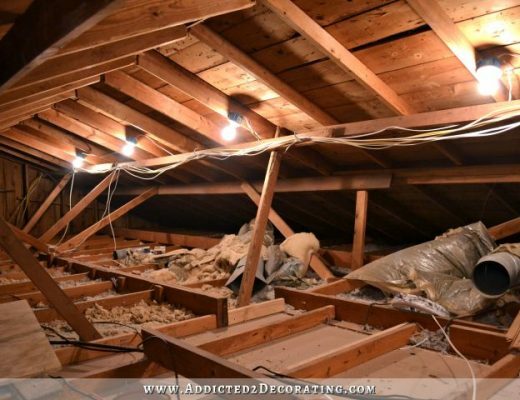 Love your posts – we’re currently renovating our house here in New Jersey and you get everything done so quickly!!! Jealous! Good idea. I’m actually considering making a space like that actually inside the garage. Half of the garage will be used for my car (since Matt doesn’t drive, we only have one car), and the other half will be my workshop, so I think I’ll have some sort of bench, dirty shoe, jacket area near the door in the garage. I love the French door idea. I orginally intended to put in pocket French doors between my kitchen/dining room and also between the dining room/living room. I decided not to do it because both those walls were load-bearing, so the work (which I could do myself), and the cost were WAY too much for the benefit (or so I thought). I still regret not doing it! Anyway, I would rethink the size of the doors. Thirty inches is way too small for comfort, and a lot of furniture will not make it through the opening. The doors themselves (even when open) will take up space between the door jambs.The least I would go for is 32″, but I would not do less than 36″. Personally, I wouldn’t do less than 48″. I think you’re misunderstanding the plan. Darn, I wish I had taken the time to draw up my idea!! But the actual doorway will be something like five feet wide. The French doors will simply be used as stationary windows on either side of the five-foot-wide opening. So if I purchase the 30-inch bi-fold French door, that will give me one 15-inch panel to use on either side of the five-foot-wide doorway opening. Yes, I obviously misunderstood! Duh!!! I would still make the opening wider. The two 15″ doors on each side will take up half of your 60″ opening, still leaving only 30″ to walk through. I would make the opening 6′ and use the 15″ doors. I wouln’t make the panels narrower because if you use anything less than 15″, you’d have more frame than glass. The opening…the actual opening…will be about five feet wide. I’m not using the doors as actual doors. They’re considered part of the wall. Ok, I’m finally getting it! You’re using 15″ French door panels as “side lights” with a 5′ opening between them. I’ve thought about doing something like that using four equal sized doors, 2 being fixed on the sides, and the other two hinged so I can fold them back out of the way. I really miss not having those French doors I had originally planned on. loveliness on each side will be wide enough? It might look skimpy. Just subscribed to your blog; looking forward to seeing the changes you make. I really LOVE your ideas! The living room could become a formal dining room if you created at least a pass-thru. Finishing my comment: I would think that you would never use the front living room so I would create a doorway so that it can be used as a dining room if you decide that would work better for you. I think I’d use it more as a living room. Like I said in another post, I grew up with a formal living room and a family room, and I really like that setup. That way when people drop by unexpectedly, we can sit in there and I won’t have to expose them to the “lived in” areas of the house. I also plan on putting a fireplace in there, and making it a really comfortable sitting room, so I can definitely see myself sitting in there and reading or just relaxing. I must say I did a huge sigh of relief when I saw your new floorplan here. I think it’s pretty much perfect. I kept looking at the other ones you had come up with and they just seemed off. Mostly because of the utility room and mudroom locations, it just made no sense to me. I don’t know if someone actually mentioned moving the utility/mudroom there or you thought of it, but that’s what I was trying to do in my head also. 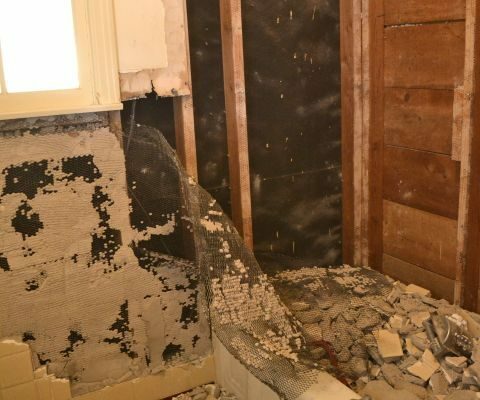 Only I thought it was impossible because I was thinking taking a bit of the future bathroom or closet space that was currently nonexistent, and that you wanted to eventually raise the floor in the current sunroom which meant it couldn’t go there yet. So yeah, how did you come up with this conclusion? 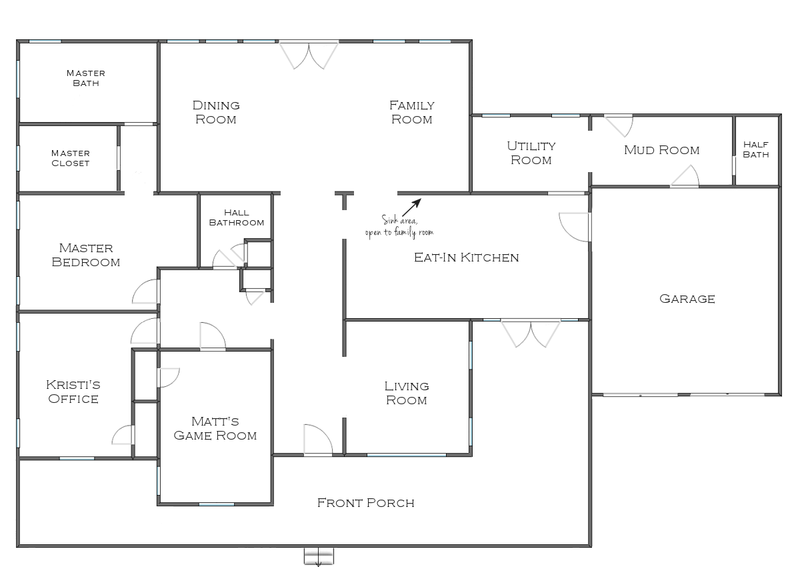 The only thing I’m just wondering about this final floor plan is the size of the closet and master bath, which look tiny and huge respectively. And also there’s no guest room anywhere? But that was in the first floor plan change so I guess you just don’t really need one. I’m SO glad the utility room is no longer where you wanted it at first and you get those windows to make a brighter kitchen. That was really bumming me before. And finally, what are you planning to do with the empty space/hall between the family room and kitchen, it seems quite big and waste of space. Do you think you’ll be ripping out the hall bathroom? Because then I would see expanding the hall bath into that space. I was also wondering about that space between the kitchen and family room. Are you planning on the new master bath having zero entry shower? What a great opportunity w/ building a whole new bath rather than trying to retro-fit everything. 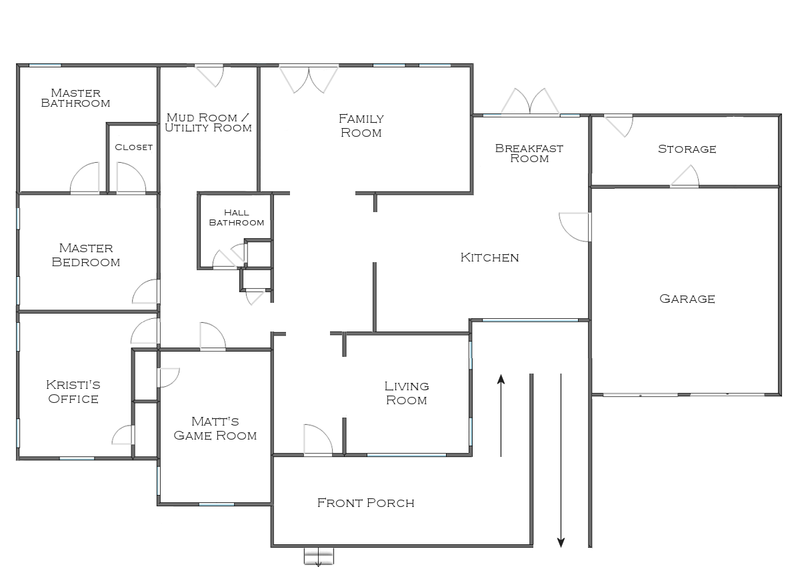 Can’t tell on the new plan, but are the master bedroom and Matt’s room 36″ doorways? I have plans for the space between the kitchen and family room. 🙂 I’ll share more when I’m ready to tackle that space. I do want a zero entry shower in the master bath. Hopefully since we’ll be building from scratch, I can get everything just right so that it’s arranged just right for easy access and use for Matt. We do plan on raising up the sunroom (basically tearing down the existing one, and rebuilding, and creating the utility room/mud room and family room in its place), but that’ll probably be at least two or three years down the line. So in the meantime, at least the water heater, washer and dryer will be in the correct place, and won’t take up room in other areas of the house. I actually have plans for the area between the family room and the kitchen. I promise, it won’t be wasted space. 😉 But I definitely won’t be expanding the hall bathroom. It’s plenty big for guests and general use, and I don’t want the added expense of moving walls and plumbing. You need to take a look again at the center of your home. You are devoting an awful lot of space to hallways. What is the purpose of the large space beside the kitchen. Most people are wanting to open up their homes. If your husband is in a wheelchair ore your openings, doors and halls wide enough for him? Master closet looks small. Good luck. I look for your updates every day. This looks great Kristi! Now it looks like a modern home with more storage and useful spaces. I look forward to your blog posts every day…There are a couple of things I was thinking but I’m not sure I will be able to describe just in words (without a sketch), so here goes! I would put a door from the breakfast room into the family room… maybe a pocket French door would be good for here like someone else mentioned? It would provide you with a direct link to the family room and you won’t have to go all the way around and through the hallway to get there and the pocket door won’t take up floor space. Speaking of the hallway, I love wide hallways but you’re losing precious kitchen space by insetting that wall so far into the kitchen (e.g., so it’s not on the same plane as the living room wall). Two or three feet can make a huge difference in a kitchen! I do like it inset but maybe not as much? Also, (since there are no measurements on here and I don’t know your kitchen layout) I didn’t know if there would be enough space for counter depth on the family room/kitchen wall with just that little jog of wall coming out… so I am suggesting you bump that kitchen wall out towards the hallway, but maybe not as far as the living room wall, and center the doorway into the hallway… does that make sense? 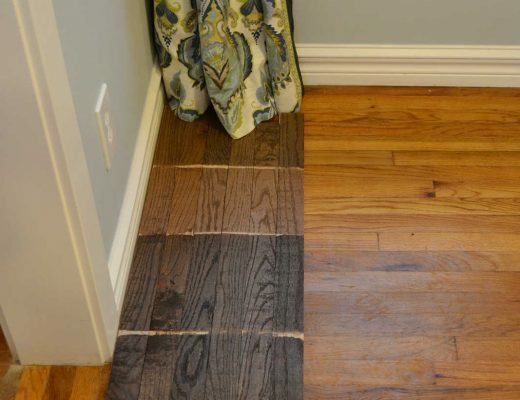 This will give you a nice wide doorway with plenty of room on either side of the doorway for a run of cabinets, pantries, bookcases, whatever you have in mind. Having said all of that, I would then think about putting (another) pocket French door from the kitchen into the living room but that would be trickier, and almost secondary to the other things, again because I don’t know what type of kitchen layout you have in mind and you don’t want to break up counter space just for a door into a room you won’t use very often. Whew! LOL, I actually printed your floor plan and sketched on it but I can’t put it on here with my comments so I hope what I said is clear and doesn’t come out as babble. I actually have plans for that space (the current dining room), so it won’t be wasted space. And since the kitchen will already be about 22 feet wide, I think the cost of moving the existing wall just to gain two feet in the kitchen would FAR exceed the actual benefit of gaining two extra feet in the kitchen. Does that make sense? I think I need to just leave the wall where it is, and work with it. Well your “brain fart” may have turned the light on in my brain. We have a very dark family room that is against a bright sunny formal living room – wall separates them. So now I am thinking…..french door wall?!?! Thanks and keep up the great work on floors. So proud you moved your laundry closest to the source of dirty laundry, the master bedroom. Also, even though I loved the look of the faux wrap around porch, I couldn’t figure out where you would put a ramp. You couldn’t have it going down in front of the garage doors. Also like that you now have a dedicated storage room for all your tools. Of course, the wall between the current kitchen and den is a load bearing wall. Hope you have a contractor who can put in a steel beam or something so you can really tear out that wall the way you want. Love watching your progress. You are doing an amazing job! I enjoy clicking on your email to see what you are up to. You are inspiration to alot of people including me. Love your creative, adventurous spirit! My favorite read everyday! I like it! Lots of room and I love that you have french doors off your breakfast area so you could put in a patio and outdoor eating/barbeque area. Funny story about the French Doors and I think they will be really nice in the living room area – add a lot of light and interest. We do not have a formal dining room and have never missed it. Our kitchen has a small eat-in area. When we host family holidays/gatherings, we use those light weight plastic topped banquet tables in our family room. They are easy to set up and take down. I know they are not formal enough for many people but our family is just happy to spend the time together. So excited for you! Like some others have commented, i would connect or open up your kitchen to the family room. Have lived in an open floor plan for 13 years and wouldn’t have it any other way! I would love to see a fireplace worked into the plan, a gas one for quick fires on a lunch hour. Kristi, I love the new floorplan! The nook in the kitchen will be so comfortable when you get it finished. The placement of the laundry room and utility room makes sense for what you have to work with and will be handy being close to the bedrooms. As for me I don’t think you will miss the dining room- not with the area in the kitchen. That is why I never had a dining room. Eight people would sit comfortably around the kitchen area, more than that we set up a buffet and the dining room would wind being a junk catcher. The middle space/hallway outside the kitchen would make a nice reading nook, with book cases and a comfy chair… and I am pretty sure that kitchen wall is a bearing wall. 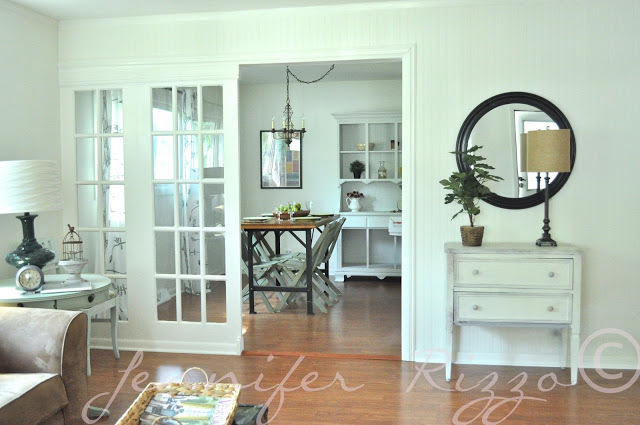 I will be stealing the french doors idea to add light to a room that I don’t want wide open. I, too, like room definition. Great plan! I’m 100% with you – I also prefer definition between spaces. In fact, I love definition between spaces! I would have hidden rooms behind bookcases if I could LOL! 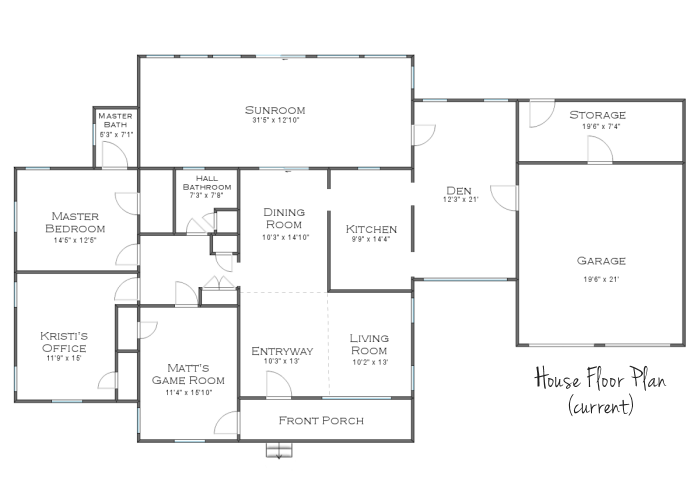 You’re floor plan came out perfect! Love the new floor plan, Kristi. It’s so well thought out. From the six weeks my husband spent in a wheelchair, I’d make every possible opening 4 feet wide. Use double doors or French doors but give the most maneuvering room possible. Love that you can make this your dream house and you are Shari the ride with us. Your plans look amazing!! I love all your ideas. Its funny isn’t it how living rooms are shrinking while kitchens and master bathrooms are growing.. Love it! BTW you can get drawings made up and ideas rendered over at HopSkipDecorate for $10 from professional architects and designers. Just a thought. You’ve got so much on your plate..
What a great resource! Thanks, Christine! I know you must have thought of this, but do you have a budget for these plans. I recently did a partial remodel and found out that a french doorway with doors was $4000 dollars where I live. I don’t know if construction costs are different in Texas, but changing the footprint of a house is also way up there. I believe a vision is very important, but don’t be surprised when even little things change like a light fixture or a wall being removed. I am looking forward to see your dream come to life. Thanks for sharing. We know it will cost tens of thousands of dollars to get everything we want. We’re okay with that. 🙂 But that’s also why we’re not just jumping right in and doing it all at once. We’ll save up for each project, and do them one at a time. It will take years to turn this house into our dream home. At least that is what I’ve always called them. I love the new floorplan! I can’t wait to see it after it is complete!! I can’t believe how addicted I am to keeping up with your projects! I wish I had a home to attempt these things with……..so excited for you!! Love the new plans! I like your idea of moving the utility room closer to your bedroom. Just a thought do you need all those doors leading to it. You have an entrance from the outside and the family room then a long hall entrance. Have you considered closing in the hallway with a door. I have always found this room can get messy fast and with it opened like that it will be seen all the time. Also did you need to access it from the family room.. Seems like it might be a waste of wall space.. Just a thought. I look forward to all your posts. Cheers. Yep, I think you’re right. I took out the doorway from the family room to the utility room. And I probably will end up adding a door at the end of the hallway into the utility room. Ok. I may be lost here but are you talking about the front entry door? Becasue I thought those were called sidelights. As in a single door with dual sidelights, or left sidelight or right sidelight or double doors with dual sidelights ETC.? I think you can even get French doors with sidelights. Is that what you are talking about? Sorry I am lost. It is a Monday after all. Nope, I’m talking about the wall that will separate the entryway from the living room. I basically want to use the French doors as stationary sidelights, but I don’t want an actual door. It’ll just be a five-foot opening.